If you are a golf lover then our very own Keswick Golf Club offers you the very best hospitality and a breathtaking 18 hole golf course set out on Threlkeld Common. 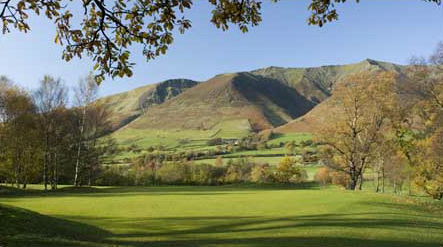 With unobstructed views of our Lakeland hills Skiddaw, Clough Head, and Blencathra, as golf courses go this has to be one of the most beautiful in England. Our self catering holiday homes are within easy reach and cater for large or small groups. The 18 holes of stunning parkland offer challenges to all levels of golfer and even though it measures 6200 yards the fairways are tree lined and the par 71 has particular surprises. The facilities available for hire include golf carts, electric and push/pull trolleys and for practice and skill work a putting green, pitching greens, driving net and practice fairway are on site. After a testing day on the golf course the club house is a welcome relief offering quality bar and food services. Visitors are welcome here so even if you have non playing golf friends or family they can join you after your game and enjoy the delights of this setting and welcome hospitality. Snacks and meals are on the menu as is the famous Cumberland sausage baguette, so head for the patio and enjoy whatever you choose looking out at one of the best views the Lake District has to offer from a chair. If your Lake District holiday includes a special celebration like a birthday or anniversary the Keswick Golf Clubhouse caters for your every need. The catering staff are fully trained to adhere to your individual requirements from buffets; waiter served sit down meals, afternoon tea, and can include special dietary needs. Music and decorations can be arranged and for those who wish to dance there is a superb dance floor area to enjoy. Whatever you need the friendly staff are here to ensure you and your guests have the best time at great value for money.